Elaeagnus pungens, often refered to as ‘UGLYAGNUS ‘ emits a fragrance that is incredible, somewhat reminiscent of Gardenia. The very first time I encountered this plant was with my (then) new friend Tara Dillard, at the Atlanta Botanical Garden. The fragrance was so marvelous, notes were immediately made to acquire this shrub; then Tara gave me the lowdown on this ‘weed’. Years later I discovered the variegated Elaeagnus (Elaeagnus pungens ‘Maculata’ or ‘Aureovariegata’) … smaller, slower growing, I was told, a perfect garden shrub. The first camellia to bloom in my garden is Camellia sinensis, the Tea Plant. No big drumroll for it is not the showiest, but then neither are crocuses, yet we delight to see them. 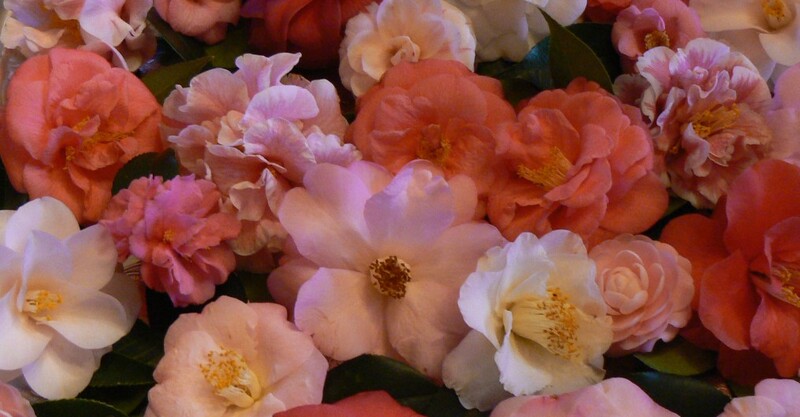 This plant is my introduction to the Camellia Season, and yes, this is the plant from which tea is made. Fast on its heels is Camellia sasanqua ‘Sparkling Burgundy’. Camellias and hydrangeas have the same cultural requirements; below, another good reason to plant them in close proximity. This was taken in the ‘Circle of Friends’ so you can see this area is really non-stop beautiful throughout the year. BTW my Camellia sinensis has provenance. It was gifted to me from Penny McHenry but it was a seedling from the garden of Martha Tate. This little darling above is Clematis odoriba … below, Clematis texensis ‘Catherine Clanwilliam’. Clematis odoriba, is not covered in any of my books (and I have many). Enter my super knowledgeable friend Lyndy Broder… (the Clematis Queen). She informed me that this plant was bred by the late Mr Ozawa in the 1990’s in Japan. It was only introduced in the early 2000’s. Mr. Ozawa crossed two native American clematis, Clematis viorna and Clematis crispa and created this beauty. In Japan, these are grown extensively for the cut flower industry as they are favored in flower arrangements for the Tea Ceremony. That got me thinking… I have a small collection of miniature, museum reproduction, Japanese porcelain vases. They are the perfect size for a small sprig of flowers… so.. The other Clematis that is blooming now, is Clematis texensis ‘Countess Catherine Clanwilliam’. I have posted about her several times (see categories), including an anecdote about being contacted by an employee of THE Countess Catherine Clanwilliam. blooming throughout the summer, and now she is blooming again. Not a big show but so appreciated this time of year. Guess it comes as no surprise that both these super-acheivers are natives.